Appropriate Technology founder E.F. Schumacher (Small is Beautiful -- Economics as if people mattered) also saw organic farming as appropriate technology: he was the president of the Soil Society in the UK, Britain's main organic farming association, founded by Eve Balfour and Sir Albert Howard. Schumacher always said he was a pupil of Mahatma Gandhi's. Indian scientist and environmentalist Dr Vandana Shiva makes the same connection, with her Navdanya group: she talks of "the two messiahs of sustainability and non-violence: Mahatma Gandhi and Sir Albert Howard." "Navdanya has trained 200,000 farmers in organic production and helps to market their crops in semi-finished or processed form. These crops are grown on organic farms certified to be organic." Many other groups in India and elsewhere are doing similar work. Albert Howard saw it the same way. One of the reasons he developed the famous "Indore" composting method in India was that the Indian peasants didn't have enough fertiliser, mainly because they used cow dung as fuel, burning it in their cooking fires. Indore compost uses only 20% cow dung, and gives better results than 100% cow dung does -- the peasants could have both fuel and fertiliser. "Organic agriculture is saving the Earth and farmers' lives," says Vandana Shiva. 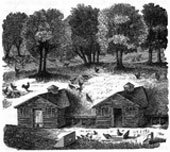 Not just nostalgia -- Cobleigh's devices and techniques were good answers to common farm problems and they're just as functional and useful now as they were then. Make your own workshop tools, a simple fence post and stump-puller, fences and gates that don't sag, building a farmhouse, barns and outbuildings, a bicycle-powered washing machine, a dog-powered pump, a lightweight orchard ladder, a portable chicken coop, a stone boat (for moving stone) and much more. Cobleigh's out to save you time and money -- a treasure for small farmers or homesteaders and anyone wanting to be more self-sufficient. Illustrated, good old-style writing, punctuated with quotes from Shakespeare or a local farmer, whichever's apt. Full text online in the Small Farms Library. "Old Farm Tools and Machinery: An Illustrated History" by Percy W. Blandford, 1976, David & Charles, Devon, U.K., 191 p.
"Farm Mechanics" by Fred D. Cranshaw, 1922, Classic reprint Series. The Mantis lightweight tiller is not just a junior-sized toy cultivator, it's an effective tool that can do things a full-sized cultivator can't do, apart from working in much smaller spaces. The Mantis weighs 20 pounds (9 kg). It was designed 30 years ago for professional landscape gardeners and it's the world's best-selling tiller, with more than a million sales. The twisted "serpentine" tines spin at 240 RPM -- twice the speed of ordinary tillers, digging down to 10" (25cm), cutting through hard sod, compact soil or tough weeds, turning it all into finely textured soil ready for planting. The 9-inch (23cm) tilling width makes tilling or cultivating between rows easy. The Mantis breaks sod and chops it up, incorporates organic matter, mixes in compost or lime, works soil in tight spaces, including raised beds, weeds between rows and among plants. Switch the tines around and dig just a couple of inches into the soil to weed a large 30 x 40 ft garden (9 x 12 metres) in 20 minutes, chopping in the weeds as you go. Available in three models: with an electric motor, a 2-cycle gasoline engine, or a Honda 4-cycle gasoline engine -- the Honda engine model is more powerful and quieter, it weighs 4 pounds more at 24 pounds (10.8 kg) and it's more expensive. The attachments fit all three models: the Planter/Furrower has two special tines that dig deep, 6"-wide furrows in any soil -- for tomatos, corn, beans, potatoes, asparagus, onions, root crops, also for building raised beds and cutting trenches; the Plow attachment is propelled forward by the spinning tiller tines, you walk behind -- the hardened steel plow blade forms straight furrows, deep or shallow, much faster than working by hand, banks soil for planting; also Border Edger, Lawn Dethatcher, Lawn Aerator, Hedge Trimmer Bars, more. 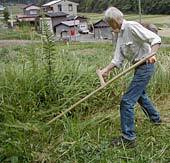 Clearing rough grass and weeds at our farm in Tamba, Japan -- we have two traditional European scythes from Slovenia, where local people still use scythes. Scythe Supply offers high-quality European-style scythes, scythe blades, snaths, whetstones, hammers, anvils and equipment. "We are scythe enthusiasts and want others to discover this wonderful tool." Lots of content and a workshop section with how-to explanations and photos. Marugg scythes -- "To our knowledge we our the only company in the U.S. still making curved hickory snaths for European style scythes." Marugg Blades are custom made by a company in Austria that has been making blades since 1540. "We are happy to report that a scythe renaissance is underway, as sustainable agricultural methods are adopted by farmers in the developed world and the internet brings availability of these awesome tools to the emerging nations. We ship worldwide.  Allen and Amy Wilson"
The Scythe Network, a co-operative group committed to promoting the use of the scythe. Technical and instructional arcticles online. Sells European blades, snaths, accessories online. "New Crops: Solutions for Global Problems" -- excellent article by Noel Vietmeyer of the New Crops project. "In Africa, where the hunger problem is concentrated, there are actually 2,000 species of native food plants. Both there and in the rest of the tropics, the region where malnutrition is severest, can be found 3,000 different fruits as well as over 1,000 vegetables. In the lands where deforestation is so destructive are to be found over 20,000 trees, some of them extremely fast growing. In the desertifying regions can be found many useful drought-tolerant plants -- I don't know how many, but it runs into the hundreds. Despite the existence of all this herbaceous heritage, hardly any tropical plant is being employed to full advantage to relieve the pervasive problems. Of Africa's 2,000 food plants, only sorghum gets major research. Of the 3,000 fruits, only banana and pineapple get solid global support, and again much of the effort is aimed at helping the rich rather than the needy. Of the 20,000 tropical trees, only a handful are undergoing global advancement. That the bulk of useful tropical biodiversity is underexploited is one of the glaring oversights of this era. The creation of more crops and the support for new-croppers is of global importance." Read on! The New Crop Resource Online Program at Purdue University, includes CropSEARCH -- a key word search engine to access crop information, CropINDEX -- a list of scientific and common names of crops for information access, CropREFERENCE -- books and manuals on crops, Aromatic-MedicinalPLANTS -- a guide to aromatic & medicinal plants, culinary herbs and spices, NewCrop LISTSERV -- an interactive bulletin board for queries, discussion, and information on crops, and much more. Easy access to a huge set of resources on crops new and old, trees, plants of all kinds. "The most comprehensive library and compilation of new and alternative crop information available on the web." Very useful indeed. In many parts of the world the major protein sources are not "farm animals" but instead "microlivestock" -- small animals managed for food. There are over a thousand kinds of reptiles, rodents, insects, birds, and other small animals that can be categorized as microlivestock. Microlivestock have been essential to human nutrition for thousands of years. In the future, these small animals may be major players in food security, environmental conservation, and economic diversity.